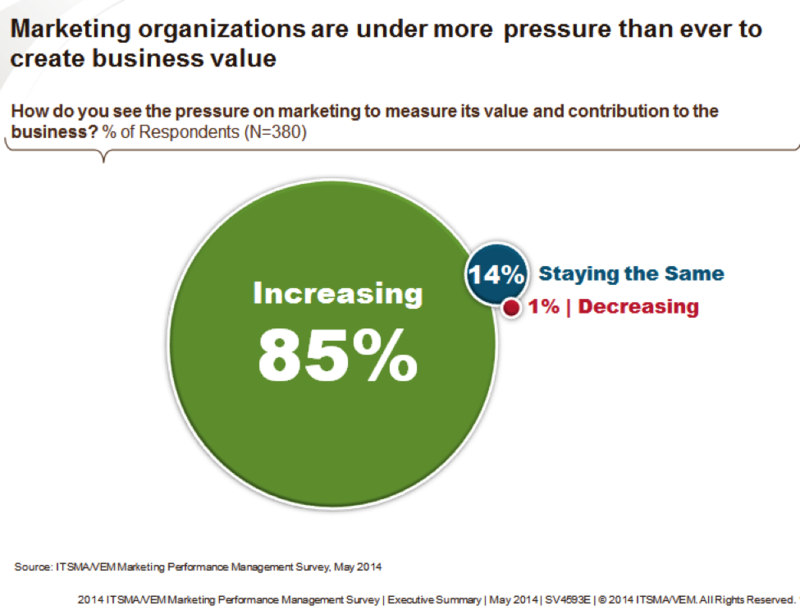 Many companies tell us that they are creating a marketing dashboard to improve visibility and alignment. 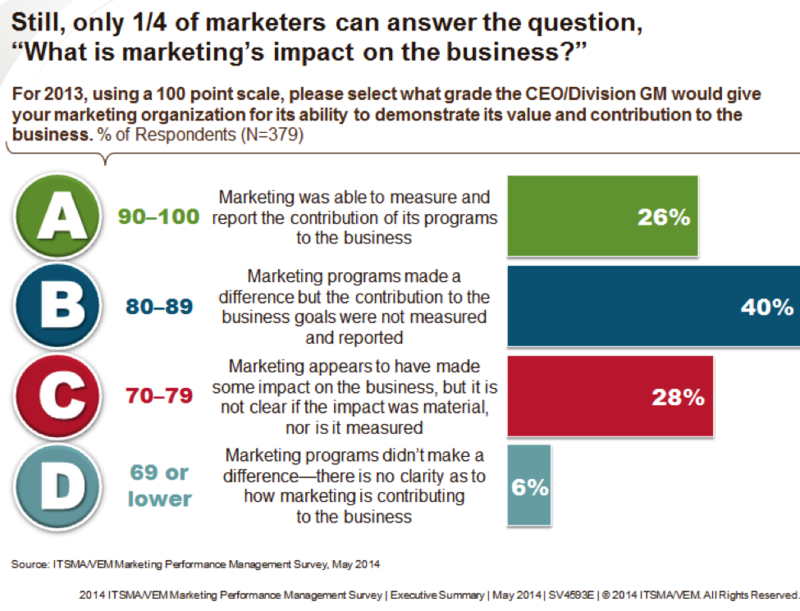 As a key element of performance management, a marketing dashboard also serves as an important vehicle for assessing marketing’s contribution. Almost every week, we’re working with a company who is trying to select the right performance metrics and develop an actionable marketing dashboard. In addition to internal factors, good data is a vital ingredient to successful dashboard. Data is needed to employ metrics and establish key performance indicators. 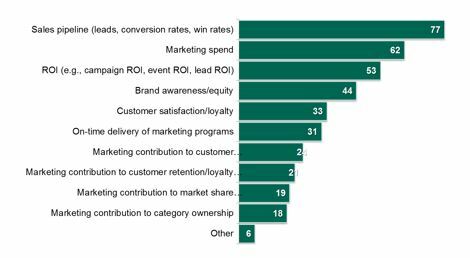 Without the data, it would be difficult to measure marketing’s value, determine how well marketing is moving the needle, and/or how well marketing is aligned with the rest of the organization and the overall strategy. However, even with the data, it’s possible for the metrics to distort reality. For those of you investing in business intelligence tools and various marketing and sales software systems, remember to put the necessary checks and balances in place to evaluate the usage and quality of the data. You will need a way to quickly address data inaccuracies so that the metrics don’t steer execution in the wrong direction. It will also be important to have a process for evaluating aspects of the organization that are hard to measure. One thing to keep in mind throughout your journey is that metrics can help create alignment as well as improve and prove the value of marketing. One of the most overlooked aspects of the performance management process is the dialogue it creates and the opportunity for organizations to discuss the meaning and implications of the metrics. The journey to create a Marketing Dashboard can be a difficult one, but once you have an excellent dashboard at your fingertips, you’ll see its value and will agree that it is well worth the investment. This entry was posted in Uncategorized and tagged marketing alignment, marketing analytics, marketing dashboard, marketing data, marketing measurement, marketing metrics. We’re drowning in data. We generate it from our own activity or research; we collect and capture tons more from external sources. And, by now, all of us have been exposed to the conversation about Big Data—the voluminous unstructured data that is collected from nontraditional sources such as blogs, social media, email, sensors, photographs, video footage, and so on. In today’s data-rich and data-driven environment, we are predisposed to gain our insights from data. But action doesn’t always follow collection. A survey of 600 executives by the Economist Intelligence Unit found that 85% of the participants thought the biggest hurdle to unlocking value from data was not grappling with the sheer volume, but analyzing and acting on it. And gleaning the insights from the data is what makes the data valuable. Merriam-Webster defines insight as the power or act of seeing. Keyword: Seeing. We must use the data to identify and see—to see patterns, trends, and anomalies. And once we gain this insight, its value is proven by the actions we take as result. Data that doesn’t help you see isn’t useful. So, in this instance, more does not always translate into better insights. In fact, according to the recently released 5th annual Digital IQ Survey, consulting firm Pricewaterhouse Coopers (PwC) found that 58% of respondents agree that moving from data to insight is a major challenge. In 1990, Stephen Tuthill at 3M helped make the connection between data and wisdom. His The Data Hierarchy outlines four important concepts: data, information, knowledge, and wisdom, with data being the raw items or events. Once we have the data, we can sort and organize it into information. Knowledge is then derived from the patterns that result from understanding the relationships between the data and other factors. Wisdom comes when we understand what to pay attention to—what has meaning for us. So, rather than focusing on more data, we need to focus on capturing the right data and then analyzing it in a way that gives us the power to see (knowledge) and act (wisdom). Bernard Marr from UK-based Advanced Performance Institute reminds us that to get the most out our data “you need to know what you want to know.” Once you know what you want to know, collect and organize the data. predictive models. Visualization is an important step for exposing trends and patterns that you might not have otherwise noticed. means. This is an essential step for going from information to knowledge. 4. Incubate the insights. Give yourself and your team at least a day away from the “board.” When you and the team return you can take a fresh look and decide whether to make any changes. determine whether you have acquired the wisdom you need to act. The success of this approach is contingent on the quality (not necessarily the quantity) of the data set, then following a process proven to identify core insights to support strategic decisions. This entry was posted in Uncategorized and tagged Analytics, Big Data, data, marketing analytics, marketing data, Marketing Insight, marketing metrics.